For Java beginners: how to use out parameters with methods. The out keyword causes arguments to be passed by reference. To use an out parameter, both the method definition and the calling method must explicitly use the out keyword. Although variables passed as out arguments do not have to be initialized before being passed, the called method is required to assign a value before the method returns. bool sharpsymbol; // Used as out parameter. const string value = "& # @";// Used as input string. Console.WriteLine ( value ); // Display value. 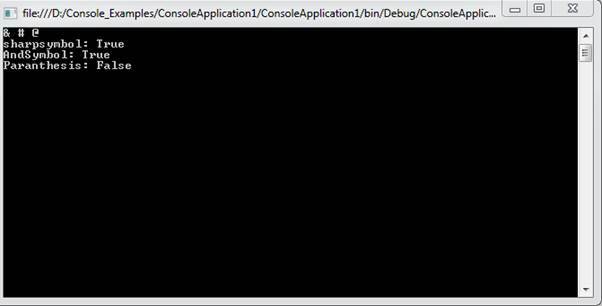 Console.Write ( "sharpsymbol: " ); // Display labels and bools. // Assign all out parameters to false. sharpsymbol = true; // Set out parameter. AndSymbol = true; // Set out parameter. Paranthesis = false; // Set out parameter. I hope the above information is useful for beginners, kindly let me know your thoughts.